This is the draft that was close to being finalized: now I can melt it down again and add more stuff... 24 Hours in the World of Singapore Art by Stephen Black 3:30 PM, June 6: Ayer Rajah Expressway Singapore filmmaker Tan Pin Pin made a movie entitled 80MPH. It consists of one 38 minute long scene: Singapore, as seen while driving from side of the country to the other. I'm reminded of the film as we speed along the Ayer Rajah Expressway as fast as the sudden tropical rainstorm allows. Suddenly, on the left side of the highway, are rows of stacked shipping containers; so high and numerous that they resemble huge multicolored buildings. Singapore's southern shoreline is like this; a corridor of shipping containers, cranes, forklifts and ships from all over the world. Near Keppel Harbor, in a warehouse across from the former Malaysian train station, is artspace@Helutrans. Inside are four galleries that may act as a snapshot of the art market in Singapore. Photographs by Pattana Chuenmana, a Thai artist are on the walls of Richard Koh Fine Arts, a gallery first established in Malaysia. Next door: ReDot, showcasing paintings by indigenous Australians. Then, the early chalkboard drawings of the American artist Gary Simmons, at Ikkan Art International, directed by a Japanese, Ikkan Sanada, and previously based in New York. Lastly, delicate miniature paintings by Lahore-based Donia Kaiser at Galerie Steph, run by Singapore native Stephanie Tham. Artspace symbolizes the attraction of Singapore for international traders and beautifully exemplifies transnationalism, an unacknowledged Singapore tradition. We exit the AYE and soon pass a sign pointing the way to a "dragon" kiln. Built into a hill, the huge kiln is officially recognized as part of Singapore's heritage, but our destination is more contemporary: Nanyang Technical University's ADM building, which also happens to be built into a hill. We round a corner and drive into NTU. A sign welcomes us in Singapore's four official languages: English, Malay, Tamil and Chinese. 9:16 PM, June 6 : Bang! Bang! Wonderland, Kovan Hub In 1999, in the middle of the decade-long Dark Ages of Singaporean Performance Art, Lina Adams attended a workshop by an artist named Tang Da Wu. The workshop highlighted the symbolism and artistic possibilities of jantung pisang, the edible blossom of the banana tree. Last month, Lina presented her own work, a performance/dinner featuring ten foods used in notable Singaporean performances. Among the foods served was tofu, a reference to Josef Ng's 1994 performance, Brother Cane, which triggered the ten year ban on performance art. As Lina and I talk, Malvina Tan-Dhanaraj performs Jiak Muay, sharing porridge with anyone who sits at her table. Two other performances will happen tonight. Singaporean performance art is revealing itself to me on many levels: past, present, political, personal, culinary, theoretical and "live". The moment resonates. What artists are awake and online? Joyotee Ray Chaudhury is and, via Facebook, I apologize profusely: heavy rains and phone troubles had forced me to cancel my planned visit to the Sree Narayan Mission, where she and her crew were working on a mural. The daughter of an art director in the Bombay Film Industry, Joyotee considers herself a Singaporean artist of Indian descent. Although 85% of the Singaporean population is Chinese, the Indian presence in the art world is strong; Joyotee's project would have been a welcome addition. Lee Wen is also on Facebook; sharing his progress about finding a ticket to Cyprus, where he is to receive an award. Once a banker, Lee Wen is now a well-respected artist. In the past we've had a few very late-night talks. I had hoped that he would be free for a bit of chitchat and an informal portrait: shelves of books behind him, two cups of tea nearby and a guitar in his hands. Singapore has plenty of blogs and websites devoted to local art, but I focus upon the online projects of two artists who use the internet in very different ways: Loo Zihan and Eugene Soh. Loo Zihan's online project is based on Singapore's most talked about piece of performance art, one that happened over twenty years ago.Brother Cane, by Joseph Ng, triggered media sensationalism, fines, bannings and initiated the Dark Ages of Singaporean Performance Art. A reaction to the government's harrassment of homosexuals, Brother Cane included a moment, when Ng, wearing shorts and with his back to the audience, snipped off strands of his pubic hair. Loo Zihan re-enacted Brother Cane, created video documentation and also set up a Facebook page, Archiving Cane, which allows anyone to record their memories of either performance. Politely radical, Loo Zihan has created a forum in which censorship, homosexuality and similar topics can be discussed freely, without control or mediation. Eugene Soh, with his gallery.sg project, has revolutionized the idea of virtual galleries by hacking a multiplayer game software. Although virtual spaces like Second Life have long had galleries in which visitors can "walk" around, gaining access was difficult for casual visitors and art was not simple to import. 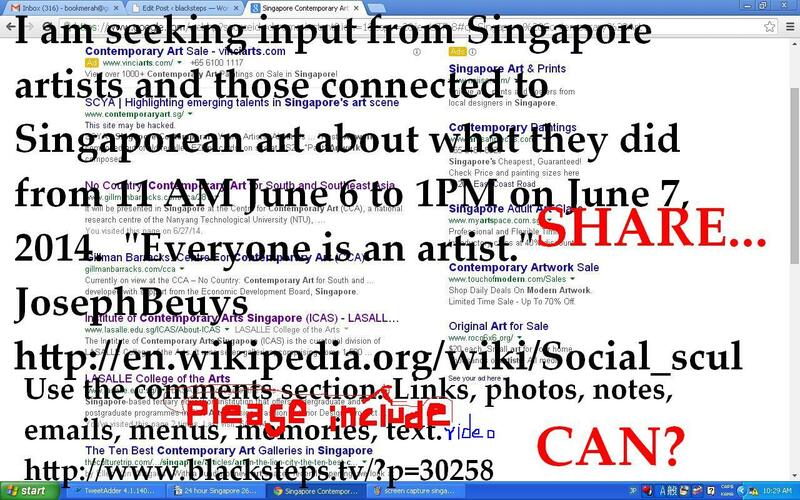 Gallery.sg requires only a simple download. The gallery feels like a playground and the works from artists like Debbie Ding, Shin and Prakash Perumal Haridas, match that spirit in a good way. Eugene's technological achievements are complemented with a sense of humor: visitors can help themselves to glasses of wine. One section of gallery.sg seems to be experiencing a flood! 6:37 AM, June 7: Third floor carpark of the Textile Center The most expensive building in the world, the Marina Bay Sands integrated resort is less than two miles away. Atop its three black towers, each 53 stories high, is a long, thin ship-like structure. A hall in the basement of MBS has, since 2011, been the home of Art Stage Singapore, a regional art fair focusing on Southeast Asian art. Art Stage attracts collectors with money; of last years 46,000 visitors, one went home with a Gerhard Richter painting worth US$800,00, another bought a Zao Wuo-Ki piece for US$1.2 million. Below, and just one block away, is the Independent Artists Resource Center. A combination of office, living room and stage, the IARC and its library are on the ground floor of a shophouse built well over a century ago. Since 2012, under the direction of Lee Wen, IARC has been a regional arts center, committed to ideas about art and community. The MBS and the shophouse seem to represent the the duality of the art world, especially in Singapore. Although it is a simplification to say that an artist must choose between making art that is either financially rewarding or spiritually satisfying, in Singapore there is one very loud voice clearly in favor of art that makes money. That voice is the government's. The Economic Development Board supports projects like Art Stage Singapore and the Gillman Barracks art complex. Government agencies make the transportation and storage of valuable artworks the best in the region and offer favorable tax schemes. Since 1989, the government has spent more than one billion dollars on the Asian Civilizations Museum, a new National Library and the Esplanade Theaters on the Bay. The cost of the National Art Gallery, set to open in 2015, is estimated at 300 million dollars. The Ministry of Culture, Community and Youth administers the striking School of the Arts campus. The Ministry of Education supports the LASALLE College of the Arts as well as a full range of art education programs. Everywhere it seems, there are grants, schemes and art funds. Nearly every project begins with the same mantra: We can apply for funding. An exception to all of this was the government's decision to not rent a space/fund artists for the 2013 Venice Biennale. 10:50 PM, June 6: Red Dot Museum The Red Dot Museum is located in the Traffic Building, a bright red, block-long structure built when the British referred to their colony as Fortress Singapore. Tonight is an event called MAAD, Market for Artists and Designers. I am too late to listen to Hell Low, but in time to catch Inch Chua's last song. MAAD is packed with the creativity-meets-shopping vibe found in street markets all over the world. The walls are lined with permanent displays honoring the winners of the Red Dot design competition, started in Germany over a half century ago. I admire futuristic vacuum cleaners and backpacks for dogs. I escape yarn bombers and reward myself with a drink. Paper jewelry, handmade books, foods, fashion and more:my energy is zapped.I stay until the second song by In Each Hand A Cutlass, then go outside in the hot, humid air to plan and review my notes from the first half of my marathon. Three major shows were visited: No Country: Art for South and Southeast Asia at the Center for Contemporary Art, Stories of Wood by the Migrant Ecologies Project at the National University of Singapore and Unearthed at the Singapore Art Museum. Following is an extract from notes written by Singapore-born June Yap,a curator at the Guggenheim, for the No Country exhibition. Challenging romanticised perceptions of the region, the artworks in No Country lay bare a complex set of conditions that resulted from the rise and fall of kingdoms and empires, and which bear the historical traces of colonization and the often-traumatic birth of nations. These works explore universal themes of national identity and community, cultural knowledge, power and faith. The spirit of Ms. Yap's words, perhaps in a less political form, could be applied to Stories of Wood and Unearthed. In Unearthed, artists such as Regina de Rozario, Charles Lim, Post Museum, Lucy Davis and Isabelle Desjeux presented works inspired by things like rubber trees, cemeteries, taxidermied animals from the British colonial period, the Singapore River and the ground of Singapore itself. Unearthed furthered its emphasis on the borderless, nonpolitical(?) world of nature by showing works produced under the Earth Observatory Station's artist residency program. Wood Stories, also called "When you get closer to the heart, you may find cracks," represents over six years of art-making and research about the regional relationships between people, wood and trees. Curated by Kenneth Tay and Jason Wee, the exhibition features photography, woodprints, DNA-based research, newspaper clippings, multimedia and found objects—including the teak bed which inspired it all. These three shows, as well as the last Singapore Biennale (which emphasized the Southeast Asia region), and last October's Ghost: the Body at the Turn of the Century (which featured a retrospective-like collection of local countercultural artists), seem to indicate that Singapore's artistic self-awareness is healthy as the nation approaches its 50th birthday. This entry was posted in Art, Artists, Photography, Singapore, Stephen Black, virtual reality and tagged art, artists, collaborations, network art, SEO, Singapore. Bookmark the permalink.